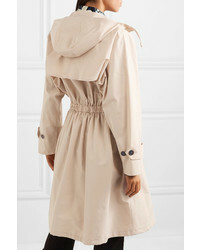 If you're scouting for a casual yet chic look, choose a Prada hooded cotton blend poplin trench coat and white jeans. As well as super comfy, these garments look great together. When it comes to footwear, this getup is finished off wonderfully with gold leather pumps. 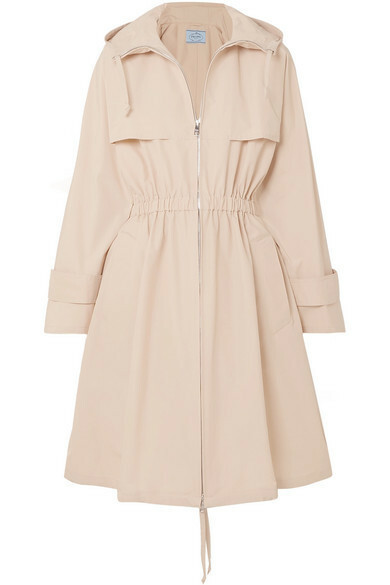 If you're looking for a casual yet totaly chic outfit, consider teaming a Prada hooded cotton blend poplin trench coat with beige shorts. These pieces are totally comfy and will look great together. Break up your getup with more casual shoes, like this pair of tan suede wedge pumps. 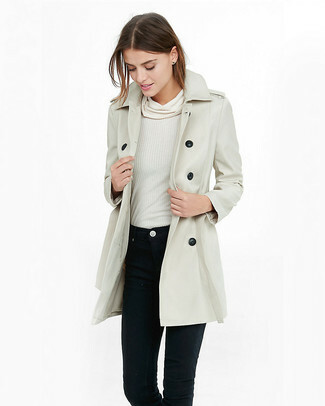 If you're on the lookout for a casual yet incredibly stylish ensemble, opt for a Prada hooded cotton blend poplin trench coat from NET-A-PORTER.COM and blue ripped skinny jeans. Both of these pieces are super comfy and they also look fabulous when paired together. Bump up the cool of your outfit by complementing it with red suede pumps. 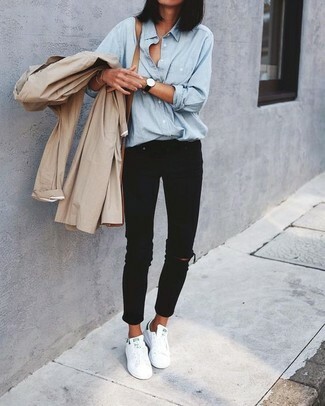 If you're on a mission for a casual yet absolutely stylish look, try pairing a Prada hooded cotton blend poplin trench coat with black ripped skinny jeans. Both garments are super comfy and look great together. White leather low top sneakers will add some edge to an otherwise classic outfit. For a casual seriously chic look, pair a beige trenchcoat with black silk skinny pants — these two pieces fit really great together. 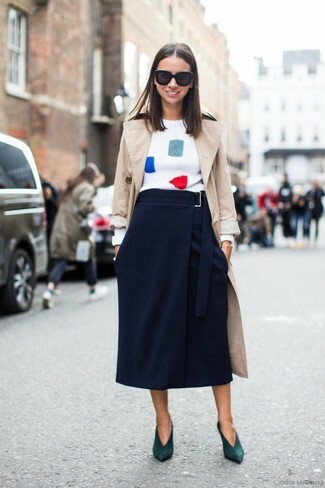 When it comes to footwear, this look is complemented nicely with black suede ankle boots. 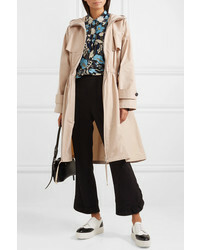 For a killer-meets-stylish getup, rock a Prada hooded cotton blend poplin trench coat with beige wide leg pants — these items play beautifully together. When it comes to footwear, this getup is complemented perfectly with red leather ankle boots. 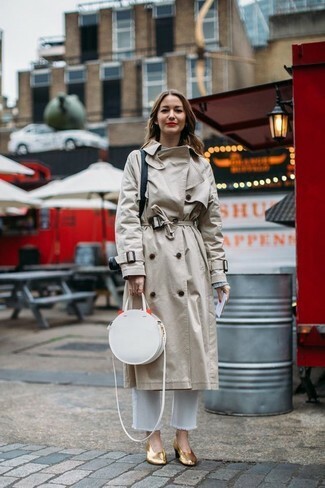 For a casually elegant outfit, consider teaming a Prada hooded cotton blend poplin trench coat with beige dress pants — these two pieces fit beautifully together. For something more on the daring side to finish off this outfit, throw in a pair of white athletic shoes. 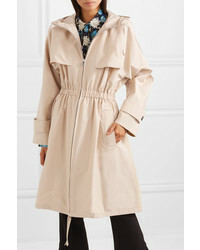 If you're in search of a casual yet chic ensemble, pair a Prada hooded cotton blend poplin trench coat with black skinny jeans. As well as super comfortable, both garments look stunning when worn together. For a neat-meets-totaly stylish look, opt for a beige trenchcoat and a navy midi skirt — these two items play perfectly well together. When it comes to footwear, this getup is complemented wonderfully with dark green suede pumps.